Que (1): Select the group of words that is most nearly similar in meaning to the most top Idiom/Phrase in capital letters. [A] Utmost hatred for someone. [C] To twist hair into a particular shape. [B] There are many large shops in a Oxford Street. [C] There are many large shops in an Oxford Street. [D] There are many large shops in the Oxford Street. Que (3): Complete the following sentence by inserting a suitable “Preposition“ form the given alternatives. Que (5): Choose an appropriate word from the alternatives given to supply a “Conjunction“ for completing the following sentence. “He acts ___________ he were already the boss”. 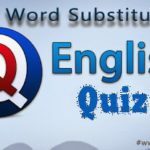 Que (6): Select the word that is most nearly “Opposite“ in meaning to the word in capital letters. Que (7): Identify the correct “Indirect expression“ of the above imperative. He says to us, “Keep the gate closed”. [A] He says us to keep the gate closed. [B] He says to keep the gate closed. [D] He asked that we were supposed to close the gate. “I remember them taking me to the zoo”. [A] They remember taking me to the zoo. [B] I remember them taken to the zoo by them. He tried / hardly to / win the race. Que (10): In which of the following sentences the use of the idiom ‘at sixes and sevens‘ is not appropriate ? [A] He apologized because the house was at sixes and sevens. [B] Our teacher had just moved in to a new classroom, and she was still at sixes and sevens. [D] The dog’s barking kept the Browns at sixes and sevens with their neighbors for months. [B] Somebody shall clean the room. [C] Somebody later is going to clean the room. [D] Somebody must clean it later. My parents are watching the kids. [A] The kids are watched at by my parents. [B] The kids were watched by my parents. The facts of the case were obscured by the speech of the defense counsel. One who is gifted with several talents. He said, “Alas! I am ruined.” What is the INDIRECT SPEECH of the above sentence ? [A] He said that he was ruined. Que(17) : Which of the following word is not its own SINGULAR ? Que(18) : What is the antonyms for “CULPABLE“. Que(19) : Which of the following has the CORRECT SPELLING ? [A] The sceneries here are not good . [C] We have received no information. [D] He provided the blinds with food. We had dinner in ______ most expensive restaurant. (2) He had leave of four days. (3) He had leave for four days. (4) He had four days leave. Que(25) : He said to me, “Go home”. Which of the following sentence correctly expresses the above sentence in INDIRECT SPEECH ? [B] He told, Go home ! Que(26) : They are playing ______ Cricket. Que(27) : Musicians mind are attuned _______ music. Fill in the blank with one of the following PREPOSITION. Que(29) : Which of the following is not a CONJUNCTION ? Que(30) : “Shun the dangerous path”. What is the PASSIVE form of the above sentence ?